You Get What You Get | What is ML Reading? 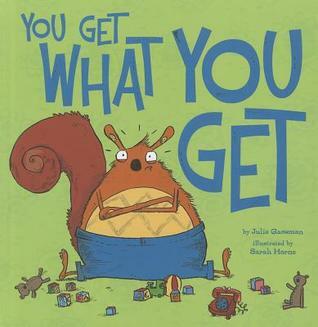 When I saw a book entitled, You Get What You Get by Julie A. Gassman and illustrated by Sarah Horne was on order for the library system, I immediately put a request on the book. I wanted us to be the first to read it. It is laugh out loud funny. My coworkers and I howled at the service desk. If somebody tried to shush us, we would have handed over the book and dared them not to laugh. Once again a book reminded us of Papa. His middle name is Melvin; something ML did not know. This entry was posted in Picture Book and tagged Julie Glassman, Sarah Horne, Tantrums, You Get What You Get by mlreads. Bookmark the permalink.